Vienna has introduced gay-themed traffic lights in preparation for this month's Eurovision contest, aiming to present the city as open-minded. Supporters also say the changes could improve road safety, attracting the attention of drivers and pedestrians. A total of 120 pedestrian crossings in the city will be replaced with the new installations, which show male and female, as well as gay and lesbian couples in the standard colors of green and red. It's a figure that has infuriated some residents and right-wing politicians. The Freedom Party has announced it is lodging a criminal complaint against Vassilakou, saying the lights contravene traffic regulations and are a waste of taxpayers' money. "That's our tax money - not your private play money! Couldn't a better use for it have been found?” one person wrote in the comments section of Kronen Zeitung newspaper, The Local reports. "There's not enough money to help single parents or build new play parks but there seems to be plenty of money for senseless things," another said. The implementation of the lights is part of a 'test phase' which will last until June. The city will then analyze data to determine whether the campaign helped traffic safety. It's not the first time that traffic lights in Europe have been the source of controversy. Last year, the dominance of male figures in traffic lights in the western city of Dortmund sparked debate, with some politicians urging the city to pursue gender equality at pedestrian crossings. 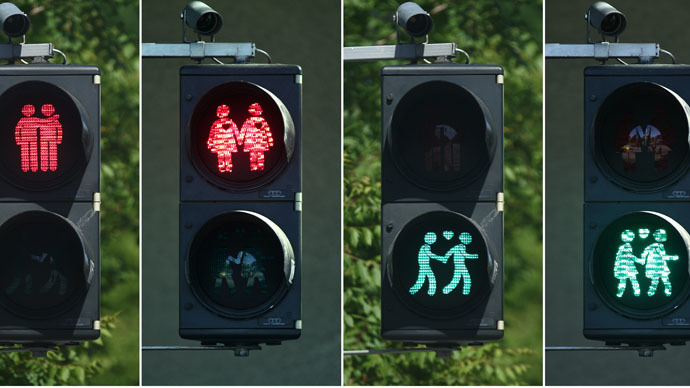 In response, the German newspaper Westdeutsche Allgemeine Zeitung proposed a light-hearted compromise – the introduction of traffic light couples. Although the suggestion wasn't taken up in Germany, it seems Vienna was more than happy to oblige. Vienna is hosting the contest following last year's triumphant win by bearded drag queen Conchita Wurst, who resides in Austria.